Anti-government protesters flooded the streets of Skopje, capital of Macedonia on Sunday, demanding the resignation of Prime Minister Nikola Gruevski. Led by the Social Democratic Union of Macedonia (SDSM), the country's main opposition party, an estimated twenty thousand people gathered outside the government building in Skopje's central square, a RIA Novosti correspondent on the scene has reported. Carrying Macedonian and Albanian flags and banners saying "Goodbye Nikola!" and "Censorship is Forbidden", the protesters chanted "Resign!" from time to time. A large screen installed on the square showed video of simple Macedonians complaining about high levels of unemployment and corruption, after which opposition figures stepped out before the crowd to criticize the government for its ineffectiveness in solving these problems. Speaking before the protesters, SDSM leader Zoran Zaev vowed that he would continue the protest until Gruevski resigns. "We will not disperse until the prime minister fulfills our demands and resigns," Zaev noted. He added that if Gruevski does not go away, "Macedonia will see a war, like in Ukraine." RIA Novosti's correspondent has reported that Zaev's thirty minute speech was interrupted repeatedly by applause and wild cheers from the crowd. Worn out by the intense heat, several thousand people left the square, while thousands more have stayed on. Temperatures in Skopje rose to 27 degrees Celsius (nearly 81 degrees Fahrenheit) on Sunday. Announcing the rally on Friday, Zaev had stated that about 70,000 people would join. According to Zaev, rally participants have been instructed to bring cameras to document any potential police violence. Ahead of the rally, Prime Minister Gruevski vowed that he would not step down. Macedonia is presently facing a situation of political instability. On May 9, Macedonia saw violent clashes between police and an armed group in Kumanovo, a city bordering Serbia and Kosovo, resulting in the deaths of eight Macedonian security officers and 14 gunmen. According to the country's Interior Ministry, the gunmen were led by five former members of the Kosovo Liberation Army. Earlier, on May 6, at least 40 people, including 38 police officers, were injured during anti-government protests in Skopje. 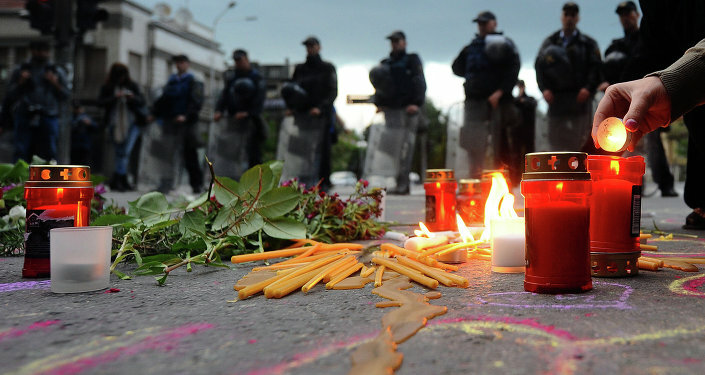 Violent political protests began in the capital earlier this year after Zaev accused prime minister Gruevski of concealing the circumstances surrounding the death of 22-year-old Martin Neskovski in June 2011. Zaev has claimed that Neskovski was beaten to death by one of Gruevski's bodyguards at a conference of the country's conservative ruling party -the VMRO-DPMNE. Zaev also claimed that he has a record of Gruevski's conversation with Ministry of Interior head Gordana Jankulovska, where the two talked about covering up the killer's identity. Gruevski and Jankulovska have denied the allegations, Gruevski stating that Zaev is attempting to blackmail the ruling party via edited telephone conversations, alleged to have been recorded with the help of unknown foreign intelligence agencies. In January of this year, Gruevski publically accused Zaev of plotting a coup against him. The SDSM had been boycotting parliament over allegations of electoral fraud in last year's parliamentary elections, demanding that Gruevski resign, form a transitional government and call snap elections. On Saturday, the Russian Foreign Ministry warned that unrest in Macedonia may lead to a Western-coordinated color revolution. The Ministry cited Serbian media reports about a Montenegro national found to have assisted Kosovan-Albanian extremists in Macedonia as "convincing proof of plans, launched from the outside, to destablize the political situation in the country, [pushing] it into the abyss of a color revolution." Sputnik had earlier discovered that USAID had spent $4.8 million on a Civil Society Project aimed at training over 1,000 people in the use of social media and activism to mobilize nearly two dozen civil society organizations. On Friday, Russian Foreign Minister Sergei Lavrov issued a statement on the crisis in Macedonia, saying that events "are developing on the backdrop of the Macedonian authorities’ refusal to join the sanctions policy against Russia, as well as on the backdrop of its active support that Skopje showed in regard to the planned construction of the Turkish Stream gas pipeline, which many in Brussels and those overseas are against." The SDSM, the successor of Macedonia's communist-era League of Communists of Macedonia, supports the idea of Macedonia as a "full-fledged member of NATO and the EU," ideas which Gruevski's government has rejected.